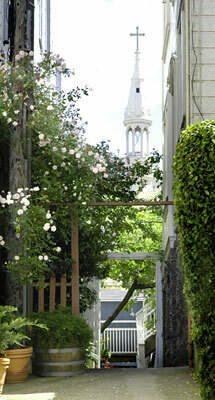 The entrance to 1 Tuscany is at the end of a picturesque, flower lined walking alley. This wonderfully romantic property is accessed through a white gate into a colorful brick lined courtyard in an interior block parcel which offers a unique secluded urban oasis. This quiet location transports one to a place of solitude and peace. 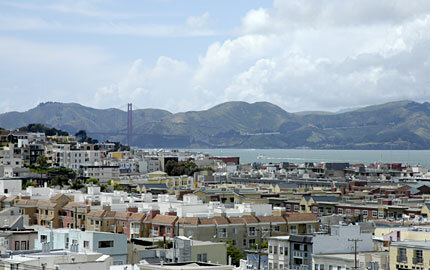 A fabulous two-level owners unit has views looking out over Washington Square and the Golden Gate Bridge. Entertaining and a high quality of life is the order of the day here at 1 Tuscany. With fruit trees, decks, southern exposure and front and rear landscaped patios, 1 Tuscany has above average outdoor space and abundant light. This 2 unit building located in the heart of San Francisco offers easy access to the best of the city: Telegraph Hill & Coit Tower, North Beach, China Town, Fisherman’s Wharf, financial district and shopping. 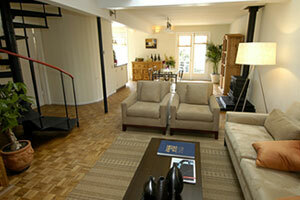 1 Tuscany provides enjoyment of historic San Francisco’s vistas & charm. This lovingly kept property is truly a rare find. The owner’s unit is configured with a large living and dining room combination, updated kitchen, a bedroom and one bath on the main level. The upper level is accessed via a stylish, steel spiral staircase. This level is finished attic space consisting of two bedrooms with Golden Gate views to the west. The kitchen has been completely redone along with new appliances. The bathroom has new ceramic tile on the floor and wainscoting. The entire interior has been freshly painted. There is a washer and dryer enclosed on the rear patio. 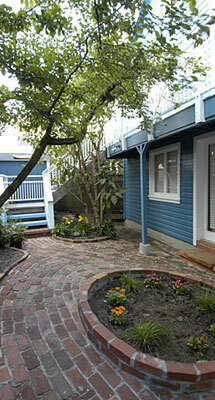 The layout is charming for entertaining and offers a real San Francisco feeling in a garden setting. This apartment features a freshly painted three room, one bath income unit used as a two-bedroom with direct access to a rear deck and outside patio area. There is a full bath with ceramic tile wainscoting in the shower. 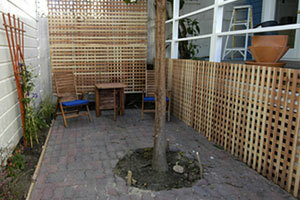 The living room/dining area and kitchen are open and lead out to the front courtyard. This unit currently rents for $1,700 a month and renter is willing to vacate or continue to stay per the buyers’ request. Seller currently leases 1 parking space across the street for $300 per month and will credit Buyer with 1 years equivalent cost for 1 parking space. Taxes will be reassessed upon the sale to approximately 1.144%	of the purchase price.